Infamous former National Security Agency contractor Edward Snowden, responsible for leaking thousands of pages of classified intelligence documents from the secretive spy organization, reportedly believes that the iPhone contains "special software" that can be remotely activated by authorities for intelligence gathering purposes. "Edward never uses an iPhone, he's got a simple phone," Snowden's lawyer said in a recent interview, as noted by Sputnik. "The iPhone has special software that can activate itself without the owner, having to press a button and gather information about him, that's why on security grounds he refused to have this phone." It is unclear whether the "special software" referred to consists of standard diagnostic tools, or if Snowden believes U.S. intelligence agencies have compromised Apple's mobile operating system. Apple was one of the first companies accused of participation in the NSA's PRISM data mining initiative, following Snowden's release of hundreds of classified NSA documents. The PRISM project is said to have involved the extraction of "audio, video, photographs, e-mails, documents and connection logs that enable analysts to track a person's movements and contacts over time." Apple immediately denied the accusation, saying at the time that they "have never heard of PRISM" and that they "do not provide any government agency with direct access to our servers." 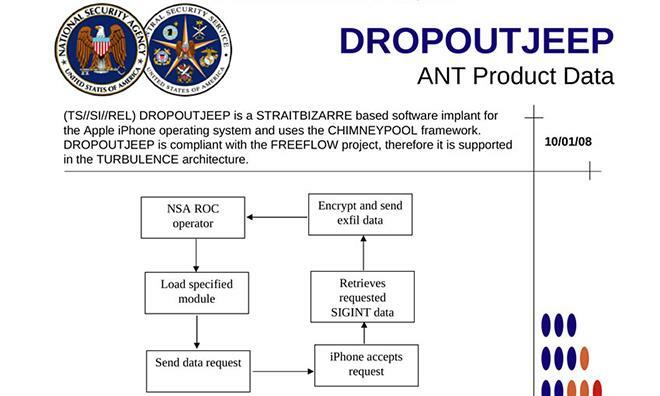 Later leaks revealed that the NSA had created spyware targeted at the iPhone, which would have given intelligence services access to SMS messages, on-board data, live microphone feeds, and positioning information. It remains unclear how successful that program was, and Apple again denied involvement. "Apple has never worked with the NSA to create a backdoor in any of our products, including iPhone," the company said following news of the project. "Additionally, we have been unaware of this alleged NSA program targeting our products. We care deeply about our customers' privacy and security."